With fall in full swing (even though it's still in 80+ degrees in Alabama), I'm burning fall candles & attempting to paint painting my nails in deep, fall colors. My favorite fall & winter nail polish picks all tend to come from OPI. I don't really care for Essie as a general rule because it chips on me really easily, but I have picked up a few of their fun, brighter shades and neutrals. But as far as fall colors go, OPI just can't be beat. So without further ado, these are my Top 5 favorite fall nail polish colors (in no particular order). So I know I said this was in no particular order, but I lied. I have a number one favorite, and it is a cult classic. 'Lincoln Park After Dark' by OPI is from a fairly old collection (The Chicago Collection), and it is a deep, dark, creamy purple-black. It is the quintessential fall color, and I also prefer this to it's counterpart 'Lincoln Park At Midnight', which is a bit more purple. This polish is new this fall from OPI's Germany Collection, and it is a reddish, purplish color that turns into a burgundy shade with shimmer. It is a really hard color to do any justice for without seeing a picture on the nails or painting it on your own nails, since the color sort of changes depending on the lighting you view it in. It is a great fall color and I definitely cannot think of any dupes for it in recent collections. This is a beautiful, true cream navy blue shade from the OPI Touring America Collection. I think everyone needs a good navy blue shade in their collection, and I prefer this to OPI's cult classic "Russian Navy". It also looked amazing for my 'Michicure' for the MIchigan / Alabama game in Dallas! Another OPI Germany Collection polish, this shade is a mix of OPI "You Don't Know Jacques" & Essie "Chinchilla", but I can't think of any exact dupes & I like it better than both of those colors. It's a typical cream, grayish-brownish-purple color, & is the perfect fall neutral. And let's be real, how CUTE is the name? A second color from the OPI Touring America Collection, A Taupe The Space Needle is an olivey-greenish cream shade with a hint of taupe. It's subtle enough that it passes for a neutral shade, but it still has the green tint to it. A great fall neutral for someone trying to add a hint of color! 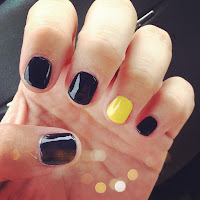 So as of now, these are the fall colors I'm rotating between on my nails! What are some of your favorite fall polishes? Leave a comment below & let me know!